I have been holding onto a fat quarter of some Laurie Wisburn donkey fabric for a few years now. This was a fabric that she printed through Spoonflower, long before Jack and Jenny came out. I always intended to make a cheerful table runner from this print, much like the Christmas versions that I made a few years back. 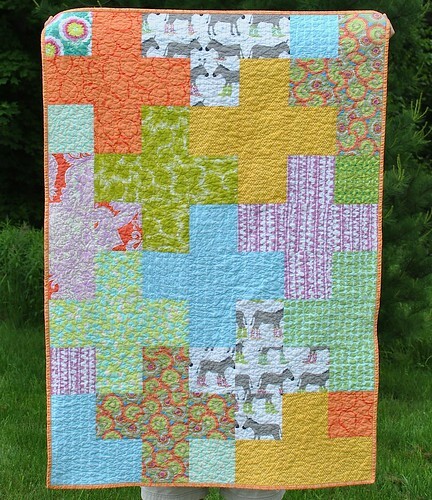 Then a few weeks ago I decided to make a simple plus sign quilt, featuring the donkeys! 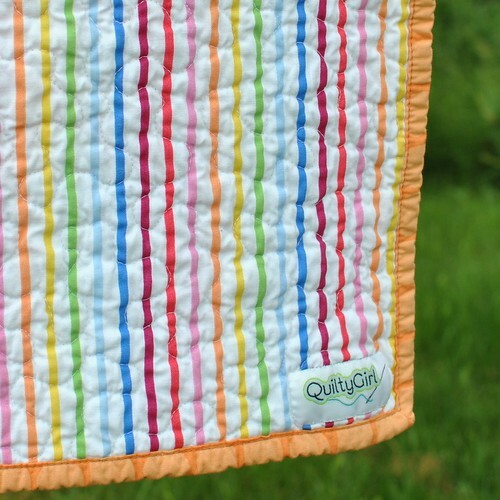 The colors in the donkey print offered such a great variety that it was the perfect starting point for this quilt. All of the fabric came from my stash (yay! ), and I had just enough of a few of these prints. I love when that happens! I also learned that this quilt design is great for mixing prints that wouldn't normally go well together. As a whole, the prints make such a great effect! 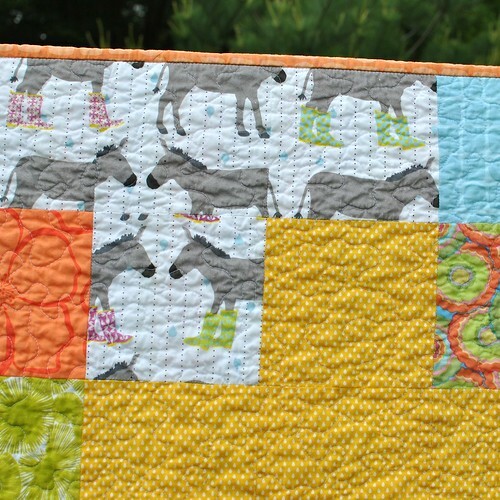 The quilting is an all over meander, and the binding (machine stitched) is from Backyard Baby. This is one of the BEST shades of orange. The backing is a rainbow stripe. Finished size is 42" x 60". It was hard to let go of this quilt, but right now it is in the local shop, Happenstance.